Once again, Bondora eclipsed its record of monthly loan originations, bringing an exciting start to a new year. Not only did we originate more loans than ever before, we did provided loans to those who have matched our historical borrower profile. A new year brought with it even more lending for us at Bondora. Total loan originations eclipsed €9 million for the first time on the month, coming in at €9,136,675. This represents a significant 8.1% jump from the previous month. Loans in Spain increased in total share to 2.45%, while Finnish loans remained the most originated. Trends among issuances by country and rating stayed fairly consistent, with Estonian loans being issued in higher rated categories, and Spanish and Finnish loans issued in lower rated categories. The category with the highest percentage of loan issuances (44.4%) was once again for F rated loans in Finland, followed by E rated loans in Estonia (12.57%). Average loan amounts increased across the board when compared to December. Loan amounts in Finland averaged €4,051, an all-time high for loans issued in the country. Meanwhile, Estonian issuances averaged €2,231 per loan, a three-month high, and issuances in Spain came in at an average of €1,723. There remains a steady trend for the age of Bondora borrowers. The average age of Estonian borrowers hasn’t changed in three months. In Spain and Finland, the average age has trended downward slightly for the past several months. This downward trend should be taken as positive for investors, as younger borrowers generally have more time in their working careers to pay back loans. 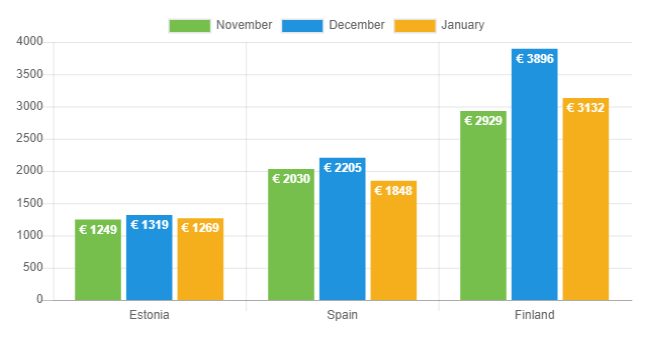 The major change in average loan durations for January was in Spain, where the average loan jumped to 47 months after dropping to 40 months in December. However, this isn’t much of an outlier, as the current month’s average duration falls in-line with durations earlier last year. Durations across Estonia and Finland remained relatively stable on the month. Bondora didn’t issue any loans in January with a duration of 3 months. More loans in Finland were issued with 36 and 48 month long durations, while 60 month duration loans were lower in the country. There was a significant increase in loans with 60 month durations in Spain, pointing toward the possibility of more stability in lending in the country. Issuances in Estonia remained relatively the same, with 36 and 60 month loans once again comprising the vast majority of loans. Net income figures came down across the board during January. Figures in Finland had the most significant drop, lowering by almost 20% to an average of €3,132 (following a significant increase in the previous month). 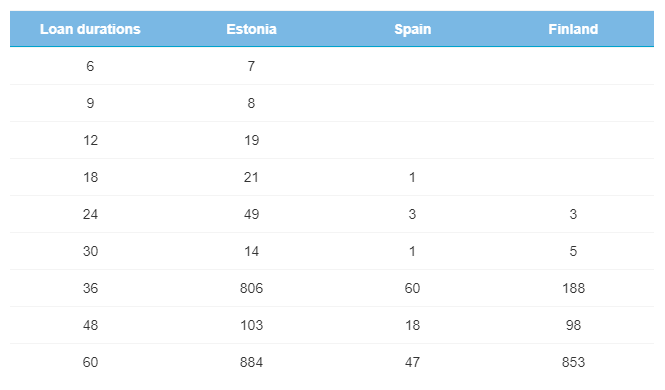 Incomes in Spain came in at €1,848, while the average income for Estonian borrowers was down only slightly to €1,269. Borrowers from Finland exhibited a more stable home ownership status in January. There was a significant increase in Finnish borrowers who are homeowners or paying a mortgage. The opposite trend was seen in Spain, where more borrowers over the month were tenants or living with their parents. Housing data in Estonia was proportionally quite similar to the previous month. The education level of Estonian borrowers was of slightly lower than the previous month, as 70% of Estonian borrowers have either a high school or university level education compared to 73% in the categories last month. Spanish borrowers are trending toward higher education levels, with 58% of Spanish borrowers obtaining a university level education. Once again, 68% of Finnish borrowers have been verified by Bondora, a positive sign for investors looking for more checks and balances on borrowers. 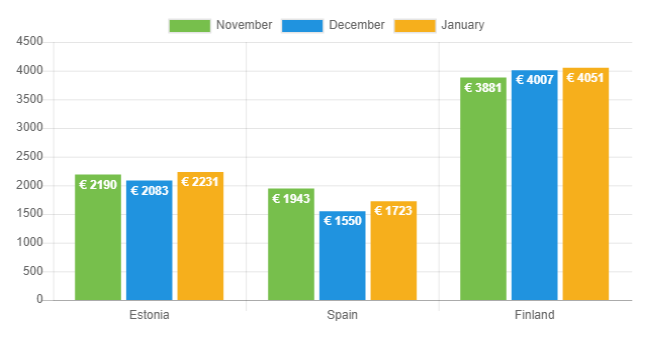 More Spanish borrowers (90%) have been verified than ever before, while 38% of Estonian borrowers were verified this month by Bondora. It isn’t just that we are always looking to boost our loan numbers at Bondora. We are constantly making sure our borrowers are set up to pay back loans in a timely manner. This requires checks and balances on borrowers economic standing and personal information to determine if they are a viable to lend to. These statistics are a helpful source for investors to see the status of our borrowers as a whole and who we allow to borrow. With the average age of Bondora borrowers decreasing, education levels rising, and verification status continuing to show positive signs, there is no better time to invest in Bondora. First time investors can take advantage of the simple and efficient Go & Grow investment option which provides an easy way to get started. Learn more about Bondora investment products here.